Extreme is a rock band consisting of singer/guitar virtuoso Nuno Bettencourt, singer/lyricist Gary Cherone, bassist/singer Pat Badger and drummer Kevin Figueiredo. 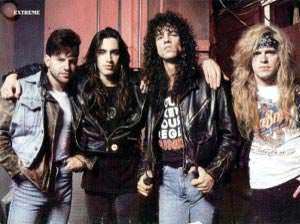 The band first formed in 1985 in Boston with then drummer Paul Geary (who later got replaced by drummer Mike Mangini) until the band decided to go on an indefinite hiatus that ended up lasting more than 10 years (1996 - 2006). The band's influences range from the progressive hard rock and elaborate multi-vocals parts of Queen, the energy of Aerosmith and Van Halen, as well as Beatlesque pop and a Led Zeppelin organic feeling. .